Canadians can heat water for domestic consumption without causing pollution or paying for expensive fossil fuels or electricity – by using solar energy. While conventional water heating appliances cost money and pollute the air, solar water heaters use only clean energy from the sun, they consume no dirty fossil fuels, and they can pay for themselves in energy savings. Even the pump in a solar water heating system can run on solar electric power. Technological advances and high fuel prices have made solar energy a cost-effective choice for water heating in Canada. A solar heating system will pay for itself in energy cost savings in five to ten years, equivalent to making 10 to 20% every year on a mutual fund investment. Water heating accounts for one-quarter of the average residential energy consumption, and a solar system can reduce that cost by 50%, saving an average of $500 a year. The cost to install a solar water heating system in an average home will be $3,500. Solar water heaters are designed for the Canadian climate, and there are units in operation that were installed more than 25 years ago. Solar systems naturally work on hot summer days, but they can also deliver bath temperature (40 C) water on a sunny winter day when the outside temperature is – 20 C. Since it has no ‘burner’ and since the only moving part is the circulating pump, a solar water heater can deliver hot water for many years with a minimum of maintenance. Systems are designed to last 20 years and come with a longer warranty period than conventional water heating appliances. Aesthetically, the collectors are the only part of the solar heating system that is visible outside your home. Modern collectors feature sleek, low-profile design, they are attractively appointed, and they are available in various appropriate dark tones to complement a wide variety of building styles. Inside the home, the solar heating system is entirely contained in a small area, usually a mechanical or furnace room, and requires only about the same amount of space as a conventional hot water tank. Piping and wiring for the solar unit is hidden behind walls or in attic spaces or brought subtly down an outside wall in a run of colour-matched insulated conduit. Canada has a growing solar manufacturing and distribution industry. Canadians understand this climate and are best equipped to design the robust technology that can handle the extremes of weather. Hundreds of Canadians make their living in the solar energy field, and each domestic solar water heater employs Canadians and improves our economy. From the factory worker at a solar manufacturing facility in Nova Scotia to a solar distribution company in Victoria, Canadians are involved in the development of the multi-billion dollar solar heating market of the future. Solar water heaters already save energy and reduce fuel costs in hundreds of homes and businesses across Canada. Solar heating systems can be sized to meet efficiently the hot water demand of a single occupant home, but the most practical application is in homes that consume large volumes of hot water. Hundreds of dollars can be saved annually with solar. In general, the more hot water a household uses, the higher the benefit derived from a solar hot water system and the faster the solar investment will pay for itself. 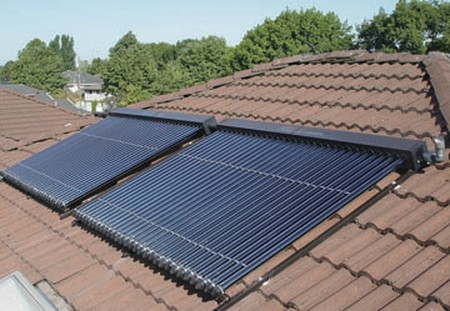 A solar water heater in Canada is designed to work as a ‘pre-heater’ with a home’s conventional water heater. The sun’s energy is gathered in the roof, wall or ground-mounted south facing panels, called solar collectors. These collectors should be installed at an angle equal to the home’s latitude north of the equator (e.g., Ottawa would set an angle of 45o). Throughout the day, a system controller compares the temperatures of the solar collectors and an indoor fluid storage reservoir. When there is enough warmth in the collectors to heat the fluid in the reservoir, the controller signals a pump to circulate a heat transfer fluid to the collectors and gather heat. That sun-heated fluid flows through a heat exchanger, which delivers the heat into a well-insulated indoor tank of water. From there, the solar heated water feeds into the home’s conventional hot water system as required. Not only will a solar water heater work in frigid winter conditions, but the systems achieve the highest performance when outside temperatures drop to – 20oC. Despite such cold ambient temperatures, the solar system will deliver water at 40oC. Units do not freeze during a winter’s night because most units are ‘freeze protected’ with a special antifreeze (which never comes into contact with the domestic water) while other models only drain their water contents back into the indoor heat storage reservoir when the system shuts down for the night. A home handyman can reduce the up-front cost of a solar water heating system by installing some of the plumbing (installation costs comprise 20 to 25% of total expenses). There is little or no maintenance to be done on a solar hot water system. To take advantage of a solar water heater, your home must have an unshaded section of roof or wall or an unshaded patch of ground close to the house. Solar systems can be designed for new construction or retrofit into existing homes. – young inhabitants, especially babies or teenagers.